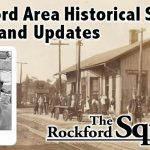 Despite the cold weather about thirty people attended our first 2018 Rockford Area Historical Society (RAHS) meeting at the community cabin on Thursday, January 4, 2018. Rockford City Manager, Thad Beard, was the featured speaker. As readers probably know, he came to Rockford from Otsego and began his tenure in our town in September of 2017. He began his presentation by giving all of us a brief look at his past including his educational background and his work experiences at Plainwell, Wayland and Otsego. After being unanimously selected by vote of the Rockford city council to fill the city manager position in our city, he told about commuting to Rockford while selling his home in Otsego and purchasing one here. The trip took about an hour because of early traffic in the Grand Rapids area. After that introduction, he spent much time discussing areas dealing with our town. Future work projects on city streets like Donald, Pearl, Spring and Prospect were covered along with upgrades to infrastructure. He also spoke about the Wolverine property, the Corner Bar plans, the Tamarack Run situation, the water system in our town, the hiring of a public relations person, the state police post, the rearranging of city office space, the Rockford library plans and other things. Mr. Beard also expressed his feelings about some events he had witnessed since arriving here. The Christmas lighting ceremony made a major impression on him. He mentioned the high school choir and the huge crowd. He spoke of being surrounded by people that he did not know and that it was different because usually he and his wife knew lots of faces. He spoke of feeling welcome and kind of overwhelmed by the situation. Readers who have attended that “Lighting” event can certainly understand the feeling of togetherness. There is a kind of “Awe” about it all! He was amazed by the Santa Claus parade and the crowd of people several feet deep along many parts of the parade route. He also experienced the rush to the Rotary Pavilion when the parade ended and children went to see Santa. He concluded his time by answering several questions and emphasized that his door was open to the public. His presentation was well received with many positive comments. 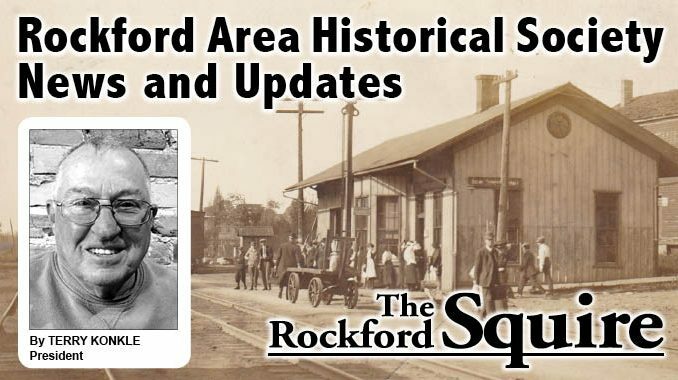 Our RAHS program schedule included a Rockford Public School update by Ryan Kelly back in September and now we have had a Rockford City update. Our Schools and our city government are major parts of our history and it is nice to be informed and up to date on them. I will close with a reminder to all that the RAHS does not meet when the Rockford Public Schools are cancelled because of weather. Also, please contact me (tnjkonkle@hotmail.com or 616-866-0530) with your comments, questions, suggestions, concerns and especially corrections. Have a great week!